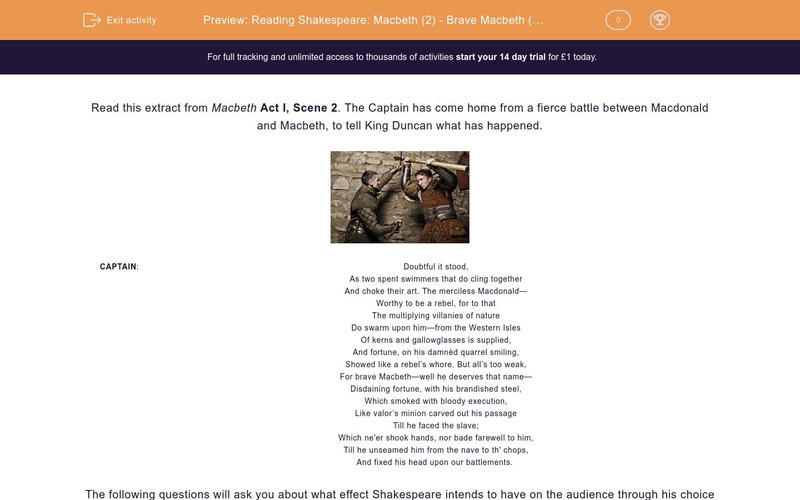 In this worksheet, students read Act 1, Scene 2 from Shakespeare's play 'Macbeth' and learn how to comment on how the author has used language and other devices for effect. Read this extract from Macbeth Act I, Scene 2. The Captain has come home from a fierce battle between Macdonald and Macbeth, to tell King Duncan what has happened. The following questions will ask you about what effect Shakespeare intends to have on the audience through his choice of language. If you need to read the extract again as you work through the questions, you can click on the Help button above the questions. The Captain compares the two armies fighting like "two spent swimmers". Choose three phrases which fit with this description of the battle. In his description of Macbeth's enemy, Shakespeare uses alliteration: "merciless Macdonald". What is the effect of this on the audience? The audience will remember him. Alliteration of the letter "m" always means evil. The audience will clearly know that he is a villain. Merciless means someone who is kind to others. In the extract, fortune was on Macdonald's side "like a rebel's whore". The Captain also adds that he had evil on his side as well as lots of extra soldiers. Why does Shakespeare include lots of information to make Macdonald seem strong and lucky? As well as real people, this passage also uses personification of "Fortune" and "Valour". Match up the words used to describe these people and virtues. Shakespeare writes that Macbeth "unseam'd him (Macdonald) from the nave to th' chaps/ And fix'd his head upon our battlements." Translate this extract into modern day English by matching up the words below. The Captain's report shows Macbeth to be very violent. What effect would this have had on the audience? People would feel sick and think that Macbeth is evil. 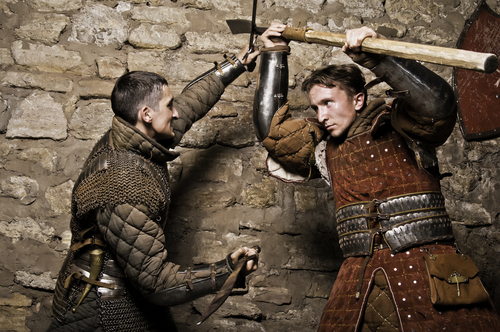 People would be amazed at Macbeth's bravery against a powerful enemy. Later on in the play, Macbeth seems to do whatever his wife, Lady Macbeth, says. Which quotation would you use to prove that Macbeth is a strong character who isn't just pushed around by her? "Worthy to be a rebel"
The play begins with three witches making an evil brew, followed by the scene we have analysed where great violence is described. Choose all of the adjectives which you think could describe the beginning of Macbeth. The battle was exhausting, desperate and too close to call. The alliteration will make the audience remember him and they will clearly know that he is a villain. Shakespeare includes lots of information about Macdonald to show that Macbeth must be amazing to have beaten him. "Brave Macbeth" proves that Macbeth is a strong character. 'Macabre' means gruesome and ghastly, so it is definitely appropriate here.